Today I present two katazome items, one from the SFAPA show and one from my personal collection. Click on the images to get a closer look. The first is from the Cavin-Morris Gallery in New York. 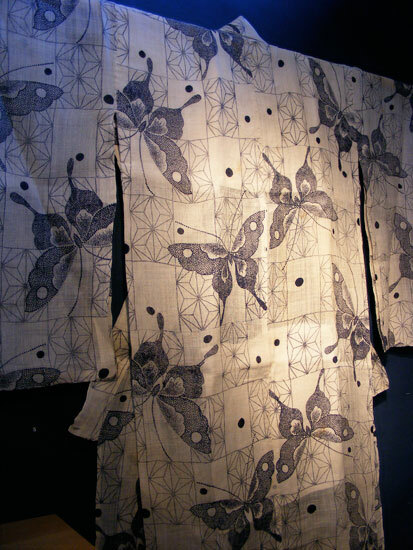 It’s a stunning katabira (帷), an unlined (hitoe 単衣) ramie (jofu 上布) kimono for summer wear. This would have been worn by an aristocratic young woman of the Meiji era (late 19th century). 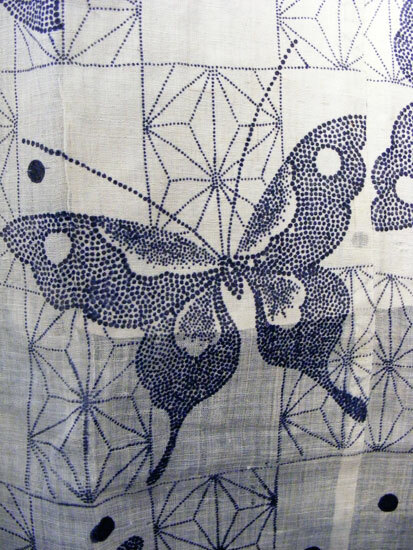 The textile is a soft, off-white color with delicately stencil-dyed indigo butterflies and asa no ha (麻の葉), a stylized hemp leaf design. Light as this was, it would likely have been worn with at least one or two other layers. The fiber and weave allow for significant air flow, especially important in Japan’s humid summers, but modesty would dictate more than one layer be worn at a time. The square of fabric where the wearer would sit acts as an absorbent panel, useful when worn at a hot spring or after a bath. 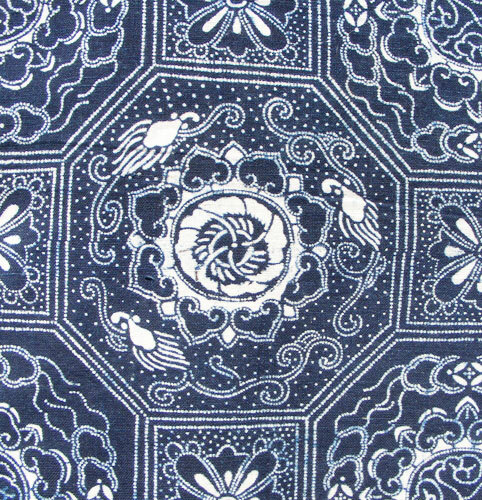 This is often sewn into the inside of a yukata or other cotton or bast fiber garment worn in the summer. You can just see it in the top part of the image to the right. Butterflies are a common summertime theme, and these have been rendered in such a way they appear very cool and breezy. 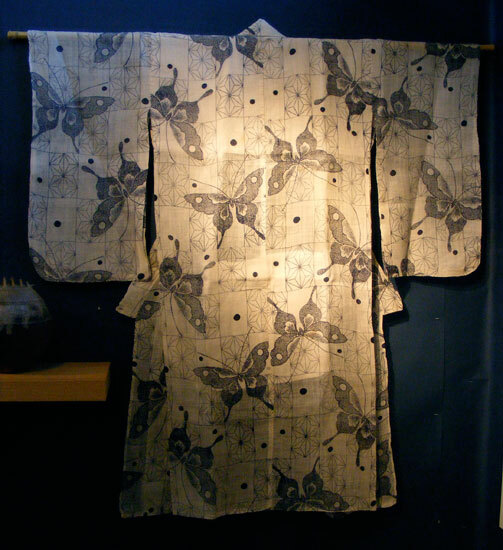 This katabira may have been designed for evening wear, as the light color would stand out in the deepening shadows, and the ephemeral butterflies would sparkle in moonlight. Such is the benefit of dyeing with the katazome technique, as it allows for such finely rendered detail. So how is it done? Katazome starts off as a design sketch on paper, which is then carefully punched and cut with fine, sharp tools onto a specially made mulberry paper that has been treated with persimmon tannin. A stencil created in this way will be strong yet flexible enough to last many years. The stencil design will generally be the same width as a bolt of fabric, around 14″ (36 cm) wide, plus a few inches framing it to make it easier to handle. Length will vary depending on the design and how often it repeats. 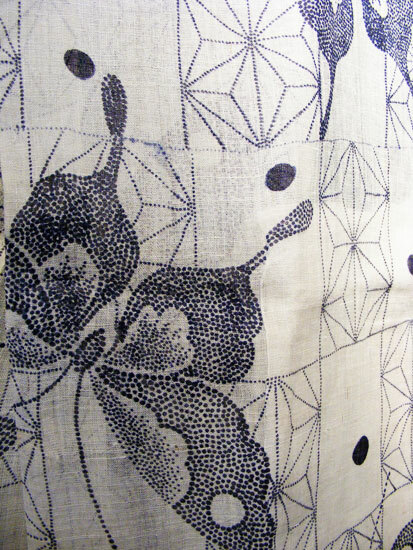 A dyer with careful hands will place the stencil so accurately that no break in the completed design will be visible. 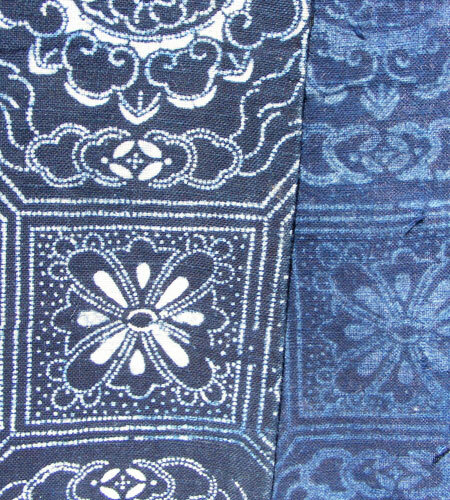 To make it even more complicated, chugatazome is a style of katazome dyeing that involves printing on BOTH sides of the fabric! It takes incredible skill to line everything up just right– twice–on twelve meters of fabric. 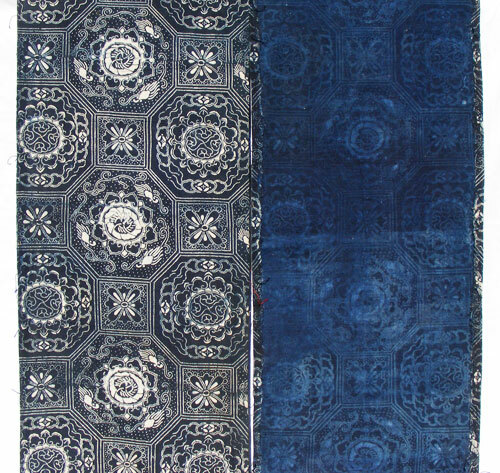 While the fabric above would have been directly dyed through the stencil (so far as I can tell, I am not a dyer myself), this next piece would have been treated with a rice paste resist through the stencil, then dip dyed in a vat of indigo. Technically, this makes it aizome (ai meaning blue). Note the difference in color from front to back. This appears to have once been used as a futon cover, but came to me as a single length of fabric so I can only assume such provenance. The cotton is handwoven, hand dyed and perhaps even hand spun. The stencil was not so expertly placed, as evidenced by the irregular areas where it jarringly meets. The stencil design itself is only 12.5″ wide by 8″ long (32 cm x 20 cm), rather narrow by today’s standards. The textile is thick and soft, with a good drape and hand. Years of use and wear have actually aged it quite nicely, although I’m sure it was far more impressive when it was new. I imagine it may have been a wedding gift, new bedding for the bride and groom from the bride’s family, perhaps. More to come very soon as I am finally clearing out the last of the photos on my desktop. I spend several hours researching each of these posts in the hope that I can provide you with factual information, so if you notice any glaring errors, please do let me know. Soon to come, katsuri. Or gasuri. Or double ikat… I have several examples both from the SFAPA show and my own collection that I look forward to sharing with you. I’ll also be featuring a modern piece from the Cavin-Morris Gallery, whom I humbly thank for generously sharing their items and information with me. **ikat ikat** I have a katsuri stuck in my throat. Or is it a gasuri? …not sure how I stumbled across your blog, but so glad I did. WoW ! This was really informative and has my creative imagination spinning. Do you have any idea where I might find one of the old stencils to play with ? I’m thinking of using it with clay.